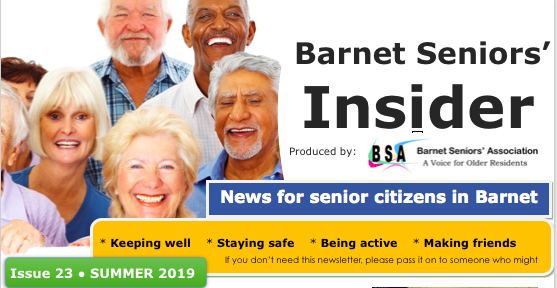 The Insider contains news for senior citizens in Barnet. It gives practical information about local services, support, events, places to go and things to do that could interest and help local people to live their lives to the full. Spring Assembly 29th May 2019. Come along to hear Dr Charlotte Benjamin, Chair of CCG talk about Social Prescribing. Enjoy lunch, meet our charity partners, make friends. Events Coordinator and Circulation manager, please get in touch if you are interested in joining BSA. Men’s health week is coming soon! 10th – 16th June 2019. It’s time to take care of your Heart with some simple tips. Why hydration and activity is so important as we enter our senior years. Did you know that as we get older we suffer from reduced sensation of thirst? Day of fun with JOY, Garden Fete, eating out, music and theatre. There are now lots of dementia cafés and clubs in Barnet. Please note the changes to latest listing. Activities and exercise, coffee mornings and fun, meet new people and make friends.